Bitcoin 2 is a scalable Bitcoin fork supporting truly anonymous and instantly verified transactions. Open source - Anonymous - Fast - Proof of Stake algorithm. are also owners of BTC2 on a 1 for 1 basis. The Bitcoin 2 balances, addresses and supply were set to equal those of Bitcoin. For early adopters annual ROI for staking is high. The blockchain data was pruned from 147 GB to less than 1.5 GB. This helps new nodes get started much faster. to be used in point of sale situations through a mobile payment processing app. SwiftTX payments confirm in a second thanks to Masternodes. Transact privately using the Zerocoin protocol and Tor. Anybody with a computer can stake to earn money and contribute to running the blockchain. Send money globally for less than a cent. As of now, maximum transactions per second roughly 40 times more than Bitcoin. Bitcoin 2 uses the latest thoroughly tested Proof of Stake algorithm. Greatly reducing electricity use compared to Bitcoin. - Based on actual data, updated daily. - Inflation is fixed at around 2% per year until maximum supply of 21m is reached. Sending the old Bitcoins can sometimes be more expensive than wire transfers and slow compared to other crypto currencies. The transactions are also trackable. With all the fighting about what to implement going on, major improvements to Bitcoin come slowly if at all. Thus Bitcoin 2 had to be born. Bitcoin 2 solves those problems and is also fast enough to be accepted as a payment method by retail shops and grocery stores due to the SwiftTX feature. Does Bitcoin 2 have replay protection? Yes, a Bitcoin transaction is not valid in the Bitcoin 2 blockchain and vice versa due to the differences between the transaction formats and the blockchains. How do I claim my Bitcoin 2s from the Bitcoin fork? If you owned Bitcoins on block number 507850, ~February 5 2018 and your Bitcoins were not at an exchange, then just download and install the Bitcoin 2 Core Wallet. You can then either import your Bitcoin private keys (Click tools -> debug console. Type: importprivkey your private key -> press enter) or copy your Bitcoin wallet.dat file (might not be compatible) to where the Bitcoin 2 Core Wallet is installed in order to claim your Bitcoin 2s. If you are worried about the safety of doing so, you can: First move your BTC to a new address, then use the private key from the "old" address (which now has 0 BTC and thus cannot be stolen) to claim your BTC2. Please note that Segwit (Bech32) addresses are not supported and cannot be claimed. If your Bitcoins were at blockchain.info, see this tutorial on how to get private keys from blockchain.info. If your Bitcoins were at an exchange, then ask your exchange to list Bitcoin 2 and credit you the balance. Let it fully sync in order to see your BTC2 balance. Tools - Information should report more than 60000 blocks. Only download the Bitcoin 2 Core wallet from this website or from the github of Bitcoin 2. How do I stake Bitcoin 2s? Just download and install the Bitcoin 2 Core Wallet and import your Bitcoin 2s there. Then all you have to do is keep the application running. What do I get for staking Bitcoin 2s? Everybody using the Bitcoin 2 Core wallet or leaving it on helps run the blockchain all the while earning Bitcoin 2s. A staker who creates a valid block gets rewarded 0.6 Bitcoin 2s until the maximum supply has been reached. The staker also gets the transaction fees for that block. The more Bitcoin 2s you have in your Bitcoin 2 wallet, the higher the chances that you will get block rewards. Only a small portion of the coins in circulation are being staked at any given time so you do not need to own a lot of Bitcoin 2s to be able to get block rewards. No more than Bitcoin. The number of Bitcoin 2s in circulation will only increase by about 2% per year until the maximum number is reached. The number of Bitcoin 2s in circulation will never increase beyond 21 million, making Bitcoin 2 a much better store of value than any fiat currency. At the current rate, in 10 years there will be almost double the amount of US dollars in circulation! This is why investing in gold or Bitcoin is so popular. What is zBTC2 and how does the Zerocoin Protocol work? 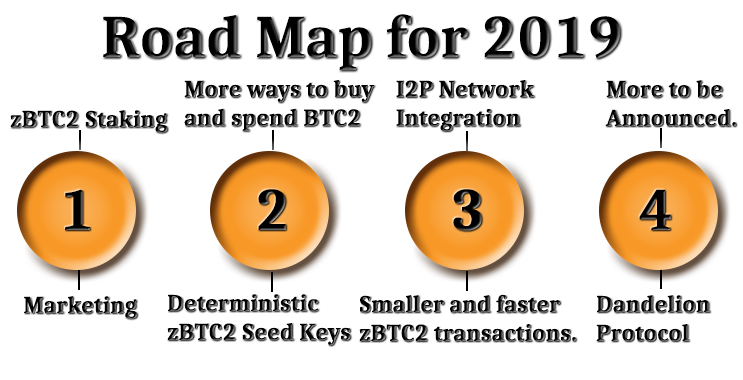 zBTC2 is the anonymous version of Bitcoin 2 that uses the Zerocoin protocol. You can convert your BTC2 to zBTC2 or vice versa in the wallet. Note that right now you can only stake BTC2, not zBTC2 (the anonymous coins). Support for staking zBTC2 is in development. What are your future development plans? Bitcoin2 Core developers alongside with any new contributors will work on: Bitcoin 2 Decentralized Exchange Network and continue to implement any further important advances in cryptocurrency technology such as the Dandelion Protocol. Our long-term goal is to partner with a mobile point of sale payment service or creating one with rewards and such in the mobile app to entice users to use it rather than visa/mastercard and create more real world use for Bitcoin 2. Anyone interested in developing Bitcoin 2 further can contribute to the Bitcoin 2 github. What is SwiftTX and how does it work? It works just like the "InstantSend" feature in Dash. When a user chooses to send a transaction as a SwiftTX, the transaction will be sent to Masternodes to process and it gets verified and guaranteed by them almost instantly. Thus there is no need to wait for the transaction to appear in a confirmed block. This type of payment is made for Point of Sale situations in the real world. They process and guarantee the SwiftTX transactions along with adding to the speed, connectivity and redundancy of the network. The Masternode at the head of the queue-like system gets rewarded 0.2 Bitcoin 2s on every newly created block (25% of the total block reward), regardless of who created the block. Most of them also get included as seed nodes after they have been online long enough. Seed nodes are the first nodes that new wallets connect to in order to find peers. How can I operate a Masternode? You will need to have 1000 Bitcoin 2s as collateral and run a VPS or a dedicated server. You can Read more about running a Masternode for Bitcoin 2 here. How to update the Bitcoin 2 Core Wallet? Just download the newest .zip/tar.gz file and copy the executable files in the bin folder to replace the ones you had installed already. How can I synchronize the wallet faster? Just download this Bitcoin 2 blockchain snapshot and follow the instructions in the ReadMe.txt. What if my Bitcoin 2 Core wallet is stuck synchronizing? Try restarting the wallet if you did not already. If you have less than 4 connections/peers after the wallet has been running for several minutes, try disabling any firewalls and deleting the peers.dat and banlist.dat files from Bitcoin 2 data folder. Then start the wallet again. If that does not help and the wallet shows that you have more than a few connections/peers, then click to go to Tools - Information - and click the "delete local blockchain folders" button to let it resync. What is the ticker symbol for Bitcoin 2? BTC2. Some services may use BCT in the future.